Sourcing local and ecofriendly foods is de rigueur, even in winter. Chefs preserve Colorado’s warm-season foods, such as Olathe sweet corn and Western slope peaches, to use during the cold season and zealously cultivate friendships with nearby farmers for winter-ready hoophouse-grown greens and cellar vegetables. Denver Chef Alex Seidel of Fruition (303-831-1962) recently purchased a farm, complete with chickens, to learn firsthand how to stock his highly detail-driven menu with food from the ground up. “There aren’t a whole lot of models for this,” he says, “but we’re really trying to complete the cycle between farm and restaurant.” Rigorous composting of Fruition’s scraps turns food waste into animal feed or soil enrichment, and some of Seidel’s customers are now asking how they, too, can get their hands dirty during planting and harvest. While continuing to push the local-and-sustainable trend, Denver chefs also embrace Colorado’s work-hard/play-hard philosophy with experimental dishes to suit health- and tech-minded crowds of resident rock climbers and biotech engineers. 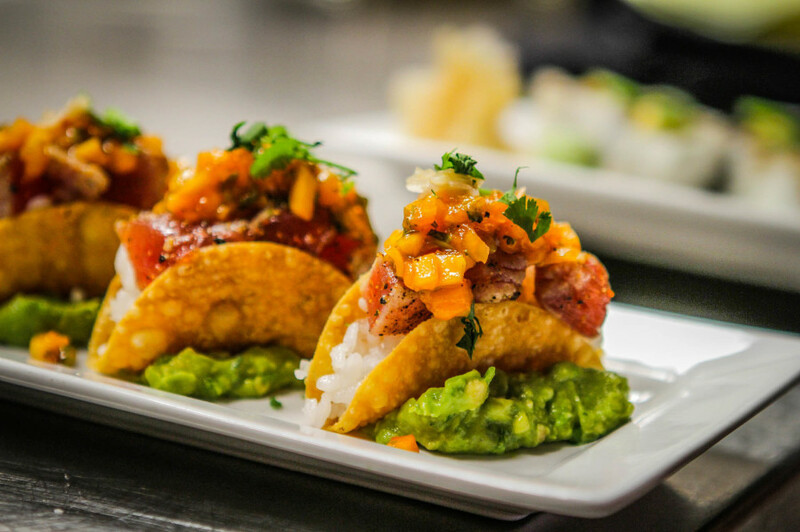 The city’s standard bearer for inventiveness, Troy Guard of TAG (303-996-9985), relishes bold food combinations, like taco sushi, which combines charred ahi, guacamole, and li-hing mango salsa. Sounds crazy, but the tastes balance while they tease, and it’s novel, eye-opening food that draws an appreciative audience. Mindful of the outdoors-addicted, calorie-burning clientele, pastry chefs are starting their own trend: dessert as a stand-alone reason to eat out. At D Bar Desserts (303-861-4710), exquisitely crafted treats are edible entertainment, from winsome cupcakes and fruit tarts to the retro S’mores Brownie: a graham cracker sandwiched by two brownies and topped with neat rows of toasted mini-marshmallows. It’s not just food that’s pushing Denver’s dining edge. At The Infinite Monkey Theorem urban winery (970-260-0710), iconoclastic winemaker Ben Parsons eschews the classic pastora setting (rolling green hills, lush vines) for a back-alley Quonset hut, where he applies his years of winemaking know-how to mix premium Colorado grapes into whites and reds that are snapped up by in-the-know chefs and sommeliers. “It’s exciting–and to some extent bizarre–that my winery is in Denver, but it seemed like the natural progression to take the winemaking process into the city,” he says. Following the microbrewery boom that began in the 1980s (with no letup in sight), Colorado beer-pairing dinners are hot, too. Duo(303-477-4141) owner Stephanie Bonin invites local brewers to discuss why to pair, say, smoked trout and picked vegetables with Dale’s Pale Ale, or chocolate torte with Yeti Imperial Stout. Maybe it’s the altitude, but when it comes to food and drink, it’s clear Denver is enjoying a heady ride. Creative versions of pancakes are Denver’s top carb-loading choice for a day on the slopes or trails. Weekend lines snake out the door and around the block at Snooze for flapjacks with alluring comfort-food treatments; one favorite stack incorporates Reese’s Peanut Butter Cups. Try a flight of pineapple upside-down pancakes with vanilla crème anglaise or carrot cake pancakes with a gooey cream cheese drizzle; both are served with cinnamon-spiked butter. Denver diners seek warm and filling food in deep winter. They find it in the juicy burger made with succulent local lamb at Jonesy’s Eat Bar.